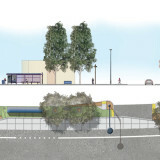 One of The Planning Center’s many roles on this 5 mile multi-year transportation enhancement project was to provide graphic rendering services for the project team and the City of Tucson. 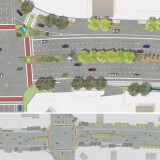 A variety of renderings were created depicting alignment and streetscape alternatives throughout roadway corridor. These renderings were extremely valuable in public participation meetings and are continually updated to reflect the latest proposed improvements.